Just weeks after the dust setlled on the public spat between the Ambani brothers over gas pricing, it is down to business as directed by the Supreme Court. Anil Ambani met the oil minisiter today to present his case for securing gas supplies which the government currently allocates only to priority sectors. 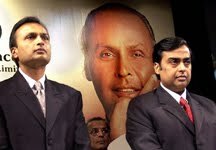 However, sources tell NDTV that Anil Ambani couldn't made much headway in his meeting with petroleum minister Murli Deora. This is because the oil ministry ruled out any change in allocations already made to priority sectors like the existing fertiliser and power plants to accomodate ADAGs power plants. But what may come as good news for Anil Ambani is the ministry's informal approval that gas allocation can be considered if production crosses 80 mmscmd. NDTV has also learnt that under the new gas agreement with RIL, gas supplies will not be confined to ADAG's proposed Dadri power plant but to all the power plants. However, every aspect of the gas pact between the cos of two Ambani brothers are dependent on the govenrment approvals. However, the govenrment just like the Ambani brothers is tight-lipped about the whole issue. “I have nothing to say about Anil Ambani's meeting. He knows me for quite some time so was the meeting,” Deora said. The SC had given both sides six weeks to renegotiate and another eight weeks to finalise a new gas sales agreement as per the rules set by the government. The Court had ruled, on May 7, that the government is the legal owner of the gas from the KG basin and has the authority to allocate gas and decide its prices. It was not just Anil Ambani but officials from Mukesh Ambani's RIL like PMS Prasad, director and head (petroleum business) at RIL, too met the oil ministry officials. And as none of the parties want any more litigation even RIL officials too is consulting the govt on every single step. Also, both the parties as per Supreme Court directive have eight to nine more weeks to finalise the gas agreement, so neither parties want to sign the gas pact in haste.